Gutiérrez was first elected to his seat in Congress in 1992. He's known for his views on immigration reform. It looks like Democratic U.S. Rep. Luis Gutiérrez is retiring from Congress. 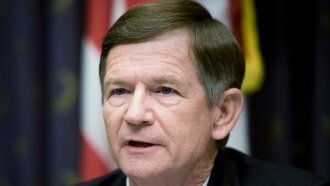 The longtime congressman confirmed his decision to Fox News on Tuesday morning. He told the outlet he plans to run for office outside Congress, but it's unclear what position he's eying. Gutiérrez was first elected to his current seat in 1992. He's a member of the Congressional Hispanic Caucus and is known for his views on immigration reform. He's been arrested multiple times while participating in protests linked to immigration issues. And in recent weeks, he's pushed hard to get more federal aid to hurricane-ravaged Puerto Rico. Gutiérrez was expected to publicly announce his decision not to run for re-election Tuesday.